William Wilberforce and his book entitled "A Letter on the Abolition of the Slave Trade"
The famous English politician and independent Member of the Parliament is shown here presenting his tome called "A Letter on the Abolition of the Slave Trade." 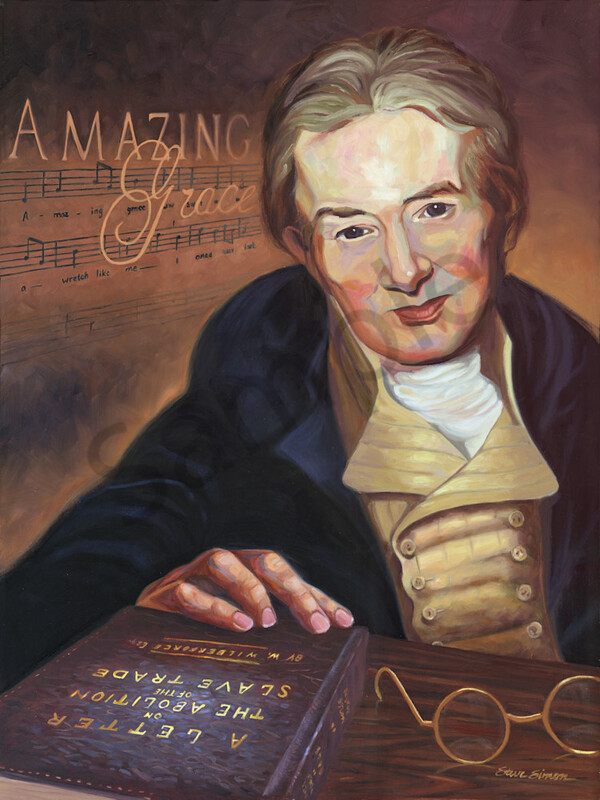 Sheet music for "Amazing Grace" provides background. It is hard to imagine, but as late as the mid-18th century approximately 75% of the world's population lived under some kind of legal slavery. Slavery was not abolished in the U.S. until 1865. In Great Britain the abolitionist cause had begun much earlier. By 1807 transacting in the slave trade was made illegal and by 1833 the practice of slavery was abolished in most of the British Empire. ​As a member of the British Parliament for decades, William Wilberforce led an impassioned lifelong battle for the abolition of slavery. He was counseled and influenced by John Newton an Anglican clergyman and former slave ship master who later fought for abolition and wrote Amazing Grace.